A bronze covered vessel of squatt baluster shape and rectangular section, supported on a tall, splayed foot and fitted with an overhead hinged handle. Each side of the body is divided into five sections by a band of vertical grooves on the lower part and a frieze around the shoulder. The frieze, composed of triple band patterns of birds, small archaic key-fret (leiwen) and spirals in intaglio, is centred on each side on a taotie mask, crisply cast in high relief. The frieze is repeated around the sides of the cover, but the central taotie mask is replaced here by geometric patterns. The slightly domed cover is adorned with vertical grooves on four sides and centred with a tall, rectangular finial. The overhead handle, adorned with a large taotie mask at either end, is fitted into hinges attached to the sides of the body. The interior of the cover and the base are both cast with a six-character dedicatory inscription. The vessel is of dark brown colour and has some areas of green patina. 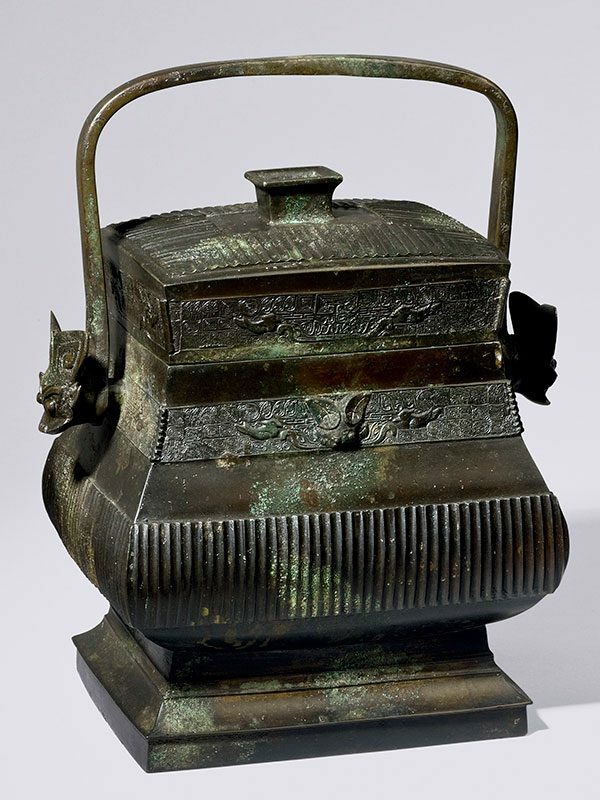 The form of this impressive vessel is derived from an archaic bronze wine vessel, fang you (‘square you’), of the Western Zhou period (c.1046 – 771 BC). The you is a lidded vessel with overhead handle for liquid offering, made during the Shang and Zhou dynasties. 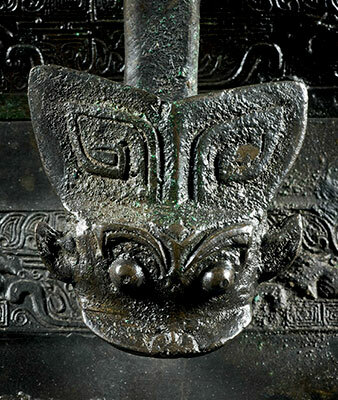 Looking at the grooved decoration and large taotie masks on the handle, the prototype of the present bronze dates possibly to the early Western Zhou dynasty, an example of which is the Gang Jie You in the Brundage Collection, Asian Art Museum of San Francisco. The tradition of imitating archaic bronzes is long lasting and can be traced back to the Song dynasty (960 – 1279), since Chinese literati sought the reproduction of ancient bronze vessels for ceremonial use in honouring ancestral spirits. 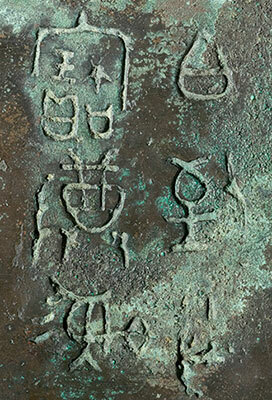 The six-character dedicatory inscriptions in archaic style mention the maker of the prototype of this vessel, Bo Zhi-.(.)..(. )… (‘Bo Zhi made this precious vessel’).